The Obama Administration recently approved new Corporate Average Fuel Economy (CAFE) standards for 2017 – 2025. The new standards are an extension of the 2012 – 2016 CAFE standards. The announcement of 54.5 MPG by 2025 certainly raised some eyebrows. Let’s take a look at what the new standards mean, and what consumers can expect. 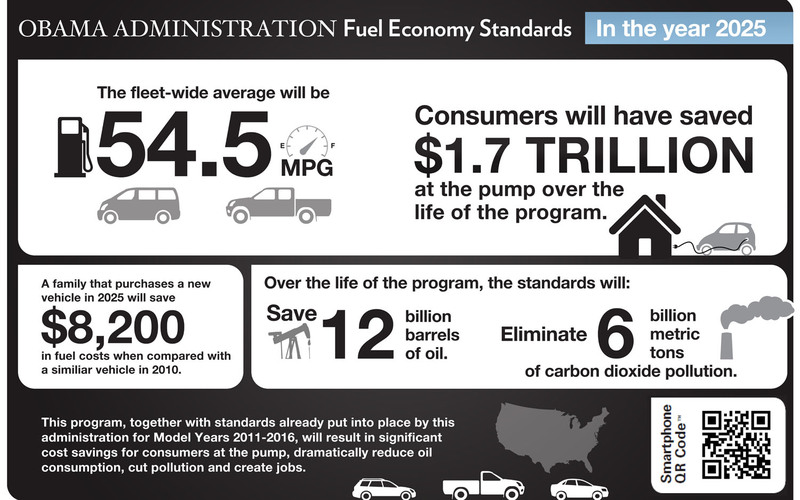 The CAFE standards represent average fuel economy standards. This means that it is the average fleet economy of new model cars and light duty trucks that must meet the 54.5 MPG in 2025. The actual MPG requirement for a given new vehicle is a function of its “footprint,” determined by multiplying a vehicle’s length by its wheelbase. Vehicles with smaller footprints are subject to higher MPG standards than vehicles with larger footprints. For example, the 2013 CAFE standard is 37 MPG for small passenger cars (e.g. Honda Fit), and 22.5 MPG for large footprint light trucks (e.g. Ford F-150). Because the overall fleet of vehicles consists of old and new vehicles in any given year, the overall fleet fuel economy will of course be lower than the new mpg standards. Another issue to consider is the manner in which new vehicle MPG is measured. Compliance with CAFE standards is measured using EPA laboratory tests that assume somewhat idealized driving conditions. The tests do not account for air-conditioning use, traffic, abrupt braking as well as many other conditions that lower real world fuel efficiency. So while, the new CAFE regulation provides the framework within which new vehicle fuel economies will continue to improve out to 2025, the practical impact of the standards will likely be less than advertised. This entry was posted in Energy, Energy Efficiency, Greenhouse Gas, Renewable Energy, Transportation and tagged 54.5, CAFE, fuel, MPG. Bookmark the permalink.